On Friday, the moon will be fully engulfed in the heart of Earth's shadow for 1 hour, 42 minutes and 57 seconds. It doesn't get much better than that. The longest possible duration of a lunar eclipse is one hour and 47 minutes, according to EarthSky.org. If you live in North America, you will not be able to see the marathon celestial event in person—unless you live in the far eastern part of Newfoundland. Unfortunately the event will be occurring during our daytime. But if you happen to be in eastern South America, Europe, Africa, the Middle East, Asia or Australia, you are in luck. The rest of us will just have to watch online. If you were standing on the moon at the time of the eclipse, the Earth would look like a black disk outlined in glowing red. That's because some light from the sun bends around the edge of the Earth where the blue and green wavelengths are scattered by our atmosphere. There are a few reasons that Friday night's eclipse will last so long. Every time there is an eclipse, the moon passes through the Earth's shadow, but it doesn't always pass through the same part of the shadow. As you would expect, the shadow of the Earth looks like a disk. Sometimes the moon passes through the top of the disk, or toward the bottom. During this week's lunar eclipse, however, the moon will pass close to middle of the disk. "The Moon is passing very close to the center of Earth's shadow, so it is passing on a chord that almost equals the full diameter of the shadow," said Steve Edberg, a recently retired astronomer at the Jet Propulsion Laboratory in La Canada-Flintridge. "In other words, the moon is taking almost the longest possible path through Earth's shadow." 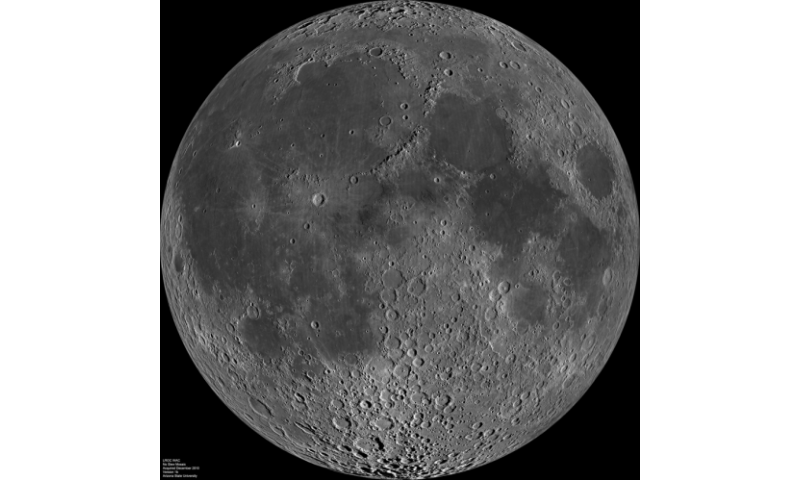 And finally—the Moon is near apogee (the most distant point in its orbit) around the July full moon, Edberg said. So it is moving slower in its orbit and taking more time in the shadow. Friday night's lunar eclipse will be more than 20 minutes longer than the last one, which occurred earlier this year on Jan. 31. That one lasted for one hour and 16 minutes, according to NASA. Even if you can't see Friday night's eclipse in real life, you can watch it on your computer. The website timeanddate.com will be livestreaming the eclipse beginning at 2 p.m. EDT Friday. The partial eclipse will begin at 2:24 P.m. - that's when the Earth's shadow will begin to creep across the moon. The full eclipse starts at 3:30 p.m. EDT and ends at 5:13. If you don't want to tune in for the whole show, I suggest watching just before 3:30. That way you can see the moon move full into the Earth's shadow. It will give you a sense of the clockwork of our solar system. And last but not least: Mars just happens to be in opposition on Friday night as well. That means it will be shining extra-bright in the night's sky. A red planet glowing next to a red moon—it should be a beautiful show. "In addition, the Earth is closer to the Sun during the northern hemisphere summer so its shadow is larger than average, he [Steve Edberg, a recently retired astronomer at the Jet Propulsion Laboratory in La Canada-Flintridge] said. Perihelion was on January 3, 2018. Good thing this guy is a retired astronomer.